Ellie Black did not suddenly “arrive on the scene” this week in the gymnastics competition at the Pan Am Games, where she won five medals. She was already there. Canada's Ellie Black won the gold medal in the women's beam gymnastics event at the Pan Am Games on Wednesday. Canada's Ellie Black claimed gold in the women's all-around gymnastics competition at the Pan Am Games Monday with a total score of 58.150. 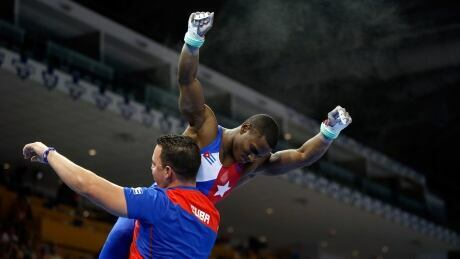 Cuba's Manrique Larduet was the surprise silver medallist in the men's all-around gymnastics event on Day 3 of the Pan Am Games, and he couldn't contain his excitement after finishing his final element. Patricia Bezzoubenko and Elle Black headline a strong Canadian gymnastics team that will compete at the Pan Am Games in Toronto. You are currently browsing the archives for the Sports/PanAm (Actual)/Gymnastics-Artistic category.